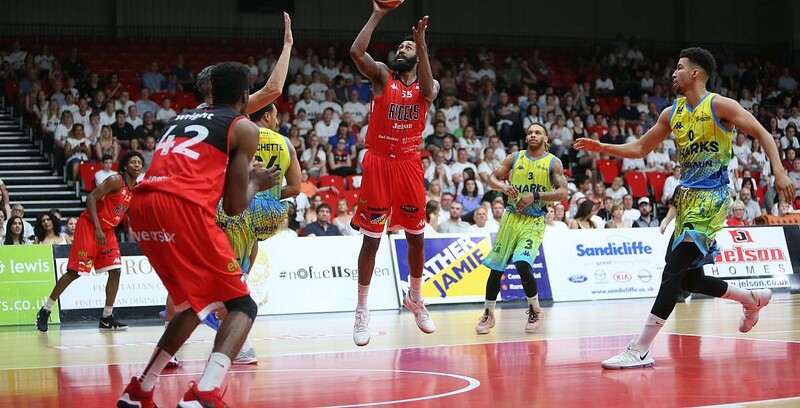 JR Holder and Pierre Hampton lead Leicester Riders into the Play-off semi-finals. Leicester Riders, the BBL league champions, have progressed safely to the Play-off semi-finals after beating DBL Sharks Sheffield 79-67 in the second leg of their quarter-final at Morningside Arena. It is the sixth time that Riders have beaten Sharks in all competitions this season, and they have now won nine straight meetings between the sides since the 2016 Play-off final. Turning point – Riders scored the last seven points of the first quarter, JR Holder sparking that run with a three-pointer and ending it too as he shot perfectly for eight points in the opening ten minutes. They added the first four of the second stanza to lead 30-16, sending the advantage close to thirty on aggregate, and there was no way back for the Sharks. Key stat – Strong interior defence was key for Riders, holding Sharks to just 30% inside (17-55) with the three big men Rob Marsden, Mike Tuck and Tony Wroblicky a combined 6-27 (22%). Game hero(es) – JR Holder (20) and Pierre Hampton (18) were typically efficient in combining for 38 points. Holder did so on 70% shooting, including 4-5 three-pointers and adding 5 assists; while Hampton shot 66% from the field.